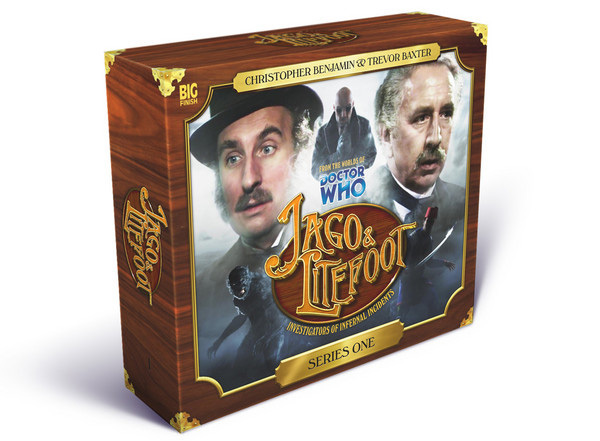 Big Finish: JAGO & LITEFOOT, Series 1 Review | Warped Factor - Words in the Key of Geek. There’s just something about Jago & Litefoot. Actually, let’s be clear, there are two things about Jago & Litefoot. Firstly, they were rendered into being by the pen of Robert Holmes, one of Doctor Who’s finest writers, with a particular skill when it came to developing secondary characters and making them feel like the stars of their own drama. That far, there’s scope for The Adventures of Garron & Unstoffe, or The Adventures of Glitz and Dibber, just as much as the adventures of the two investigators from different social strata in Victorian England, who first came together as comrades in arms against ‘Weng-Chiang’ in the company of the Fourth Doctor and Leela, and who clearly stayed in touch over the course of the next decade. Big Finish tested them out with a Companion Chronicle story, The Mahogany Murderers, and the magic between the police pathologist and the theatrical impresario still seemed to sparkle when released from Holmes’ grasp. That’s the second thing – Jago & Litefoot aren’t just Jago & Litefoot, they’re also Christopher Benjamin and Trevor Baxter, two solid thespian salts with a chemistry all their own. In The Talons of Weng-Chiang they actually don’t work that closely together. Force them into closer proximity and friendship and the sparky wonder of Benjamin & Baxter makes Jago and Litefoot something rare: like Captain Jack Harkness and Sarah-Jane Smith, they become something strong enough to exist in a world of their own adventures, outside their parent programme or the original writer who gave them their breath and their personalities. It’s a thing Big Finish has done successfully a number of times – Counter Measures, Gallifrey, Charley Pollard, Bernice Summerfield, Iris Widthyme etc – and with Jago & litefoot coming up to its tenth series, it’s clear that the pair have longevity and storytelling oomph, even some forty years after they were first invented. For the first series of Jago & Litefoot audios, we get a mixed bag of stories from Justin Richards, Alan Barnes, Jonathan Morris and Andy Lane, and there’s perhaps a raggedness around the tailoring that would be more appropriate to the stalls of Mr Jago’s theatre than it would be in Professor Litefoot’s dining room, but Series 1 at least sets Jago & Litefoot in a context from which they can expand beyond their parent show. It does that intentionally and from the very beginning – there’s Lisa Bowerman, Bernice Summerfield herself, who also directs three of the four stories here (along with almost everything that isn’t directed by Ken Bentley, it seems, and more power to her and her great ear for tone and drama), starring as Ellie, the barmaid at the public house favoured by our adventurers. Here she’s a kind of glue-character to hold our lads together, one way or another, and throughout the Jago & Litefoot adventures, Ellie grows in importance and…shall we say, skills?...to become a core part of the team. In fact, it’s through Ellie that Jago & Litefoot get involved in the first of their eponymous adventures here, by way of her brother, returning from war a changed man in The Bloodless Soldier. It’s worth saying that – certainly in series 1 – the Jago & Litefoot stories involve all available kinds of Victorian Gothic influences – werewolves, bodysnatchers, zombies, vampires and more. There’s also very much the spirit of the age – the striving towards scientific advancement, coupled with the love of a good bit of pseudo-spiritual flummery and showmanship. That last comes particularly into its own in story three of this series, The Spirit Trap, where table-rapping is all the rage and a vibration of Weng-Chiang is distinctly felt. The second story, The Bellova Devil has immigrant Bulgars, evil, brutish Englishmen, and highly creepy goings-on through the auspices of a gentleman’s club – another properly Victorian institution fixed in the beady investigative eyes of Jago & Litefoot. There’s more than a touch of Holmes to the whole thing too – Sherlock, rather than Robert – but that’s inescapable when you have two investigators in Victorian London, with all its smogs, carriages, grand buildings, dinginess, elegance, sophistication and grit. Story four, The Similarity Engine, is a weird one even by the tone of the Jago & Litefoot stories in this series. While the friends investigate all kinds of murky goings-on with all kinds of grisly consequences, Series 1 establishes their crime-fighting network, from Litefoot’s pathology partners and police liaison to Jago’s contacts in the theatrical and lower-class worlds. The Similarity Engine does all that, but also delves into their shared history, and gives us a scenario that wouldn’t be out of place in a Victorian version of the Saw or Hostel movies. It’s grim, but it’s also essential – the carrot and the stick to make you finish it, and it leads on to a ‘What the hell did I just hear?’ moment that will pull you on to buy Series 2. If The Mahogany Murderers was the pilot for the Jago & Litefoot stories, Series 1 of their adventures is the proof of concept. We already knew Jago & Litefoot were great characters, and The Mahogany Murderers proved that Benjamin & Baxter still had what it took to deliver those characters is an engaging, thrilling way. But Series 1 establishes their world outside the confines of Doctor Who. They have their own ‘plucky companion’ in Ellie, their own good-hearted flatfoot in Conrad Asquith’s Inspector Quick, and their world, shared despite its differences of social class and temperament, education and breeding, is a fascinating stew of possibilities and dangers, as they head into danger to battle werewolves, foes from the future, astrally projecting evils, their own suspicions about each other, and all manner of human unpleasantness in between. As a collection, the first series of Jago & Litefoot is by no means perfect – there’s a degree of ‘Wait, how did that just happen?’ about some of the threats they encounter, and some of it we’re asked to take at face value – but in its essentials it’s a solid four hours of hearing these beloved characters from the 70s live outside the remit of a strictly Doctor Who story, and it sets up the dynamic on which further enjoyable series can be built. 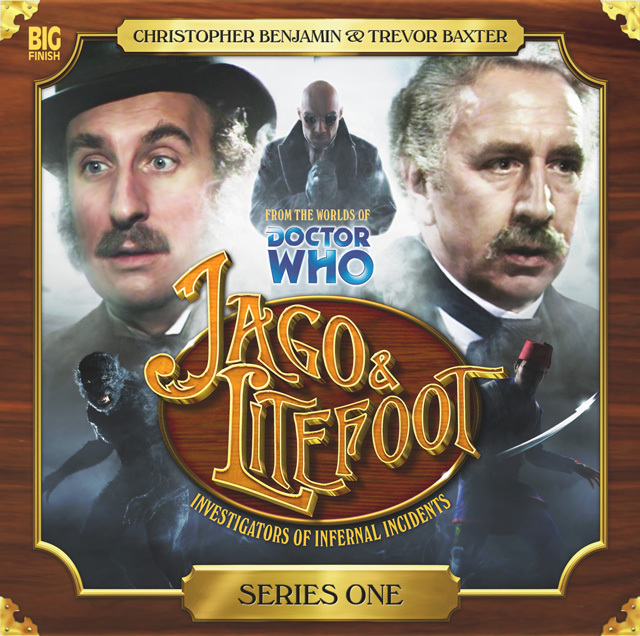 If you’re going to listen to Jago & Litefoot, there’s every chance you could jump in at the start of almost any series (though Series 5 might be an interesting challenge). But why do yourself out of the pleasure of hearing the set-up? Why not go right back to the start and enjoy Jago & Litefoot from the beginning?